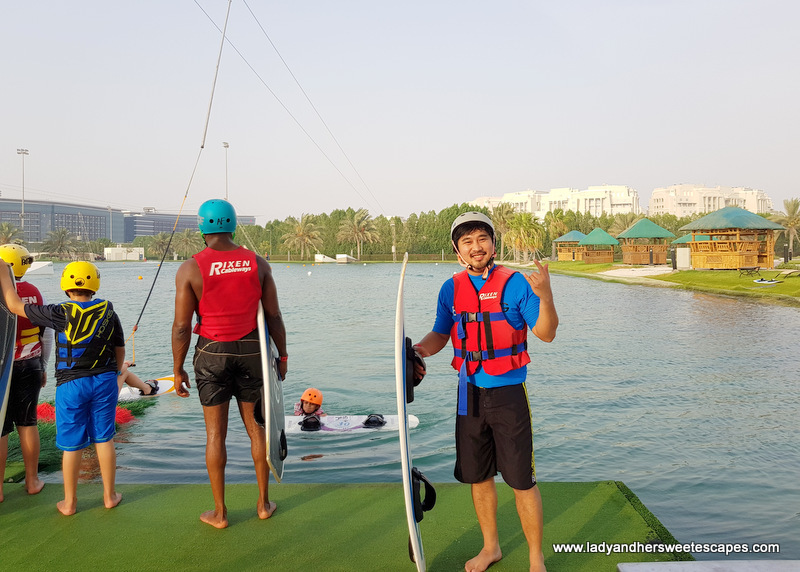 He has rode the fastest roller coaster, sky dived over The Palm, and bungy jumped at the world's highest commercial bungy! My husband obviously loves to feel the adrenaline rushing through his veins! Although I'm scared every time Ed decides to go on an extreme adventure, I love seeing him smiling from ear to ear with fulfillment. I'm not an thrill-seeker like him, not a KJ wife either; hence, the best thing I could do is to stay on the sideline and cheer. And it was deja vu a few weekends ago! 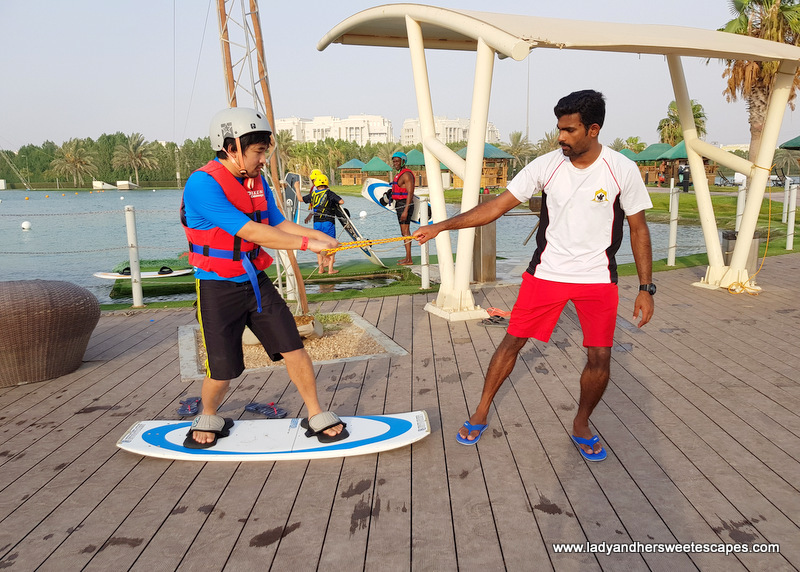 While we were staycationing at Marriott Hotel Al Forsan in Abu Dhabi, he told me that he wants to go wakeboarding! 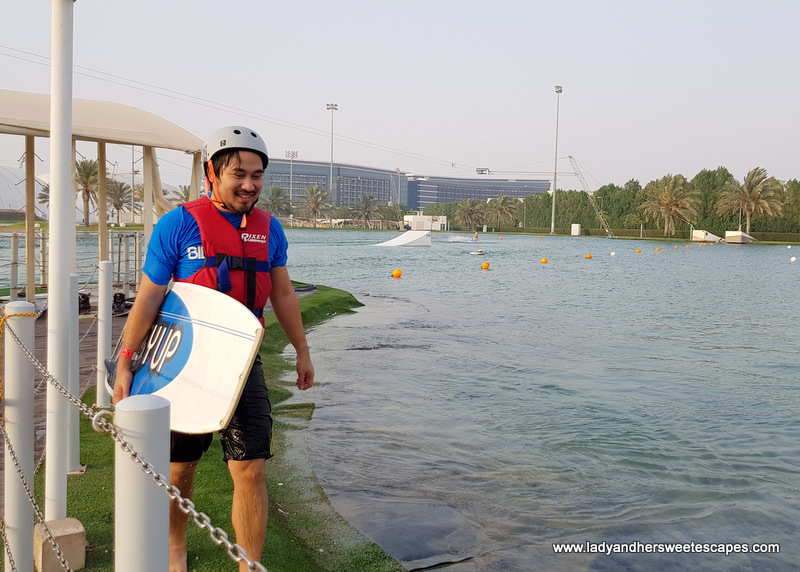 We inquired about the wakeboarding facility at Al Forsan International Sports Resort right after checking-in. Through a phone call, we were informed that we can simply walk-in; prior reservation is not needed and I can tag along with him. As summer heat was in full blast that afternoon, we waited for the weather to cool down before proceeding to the sports complex. 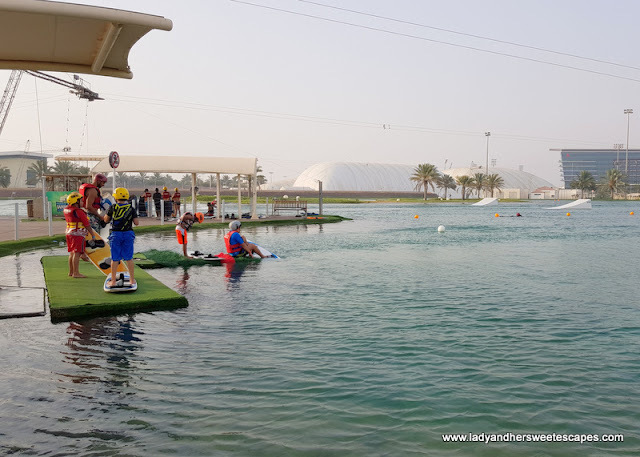 It was around five in the afternoon when we took a stroll to the wakeboarding area. Ed, filled with anticipation, was already in his rash guard and surfer shorts. 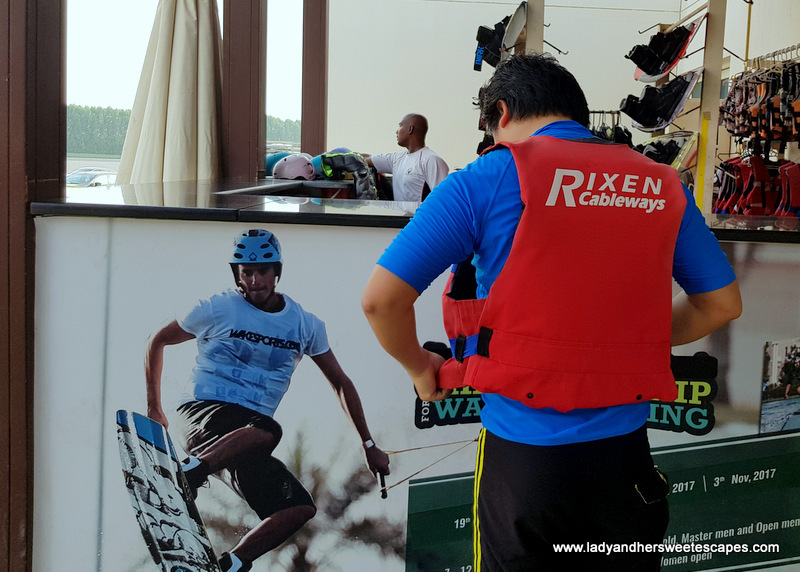 We read online that wet suit for wakeboarding is available at the water sports center, but renting will cost us extra bucks. Marriott Hotel Al Forsan is conveniently located in the heart of Al Forsan International Sports Resort. 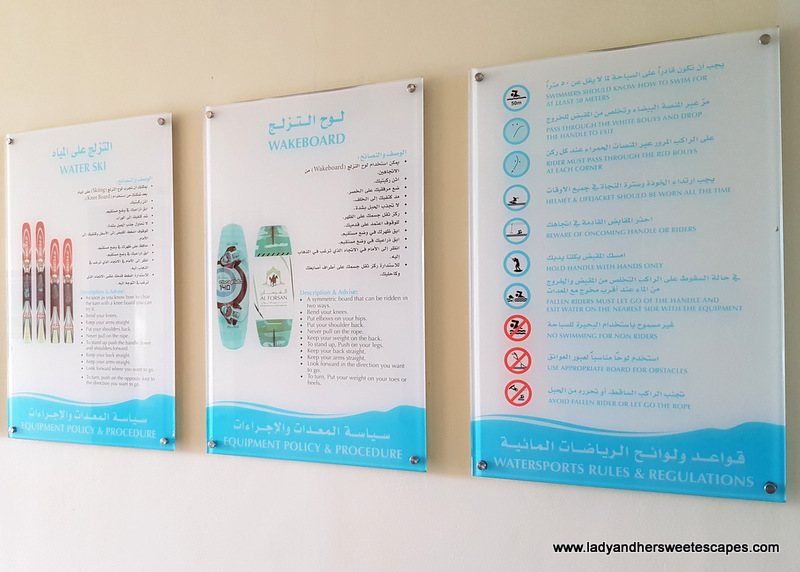 It only took us around 5 minutes to arrive at the water sports center by foot. We met a staff along the way and he told us to head straight to a small building near the lakes for registration. 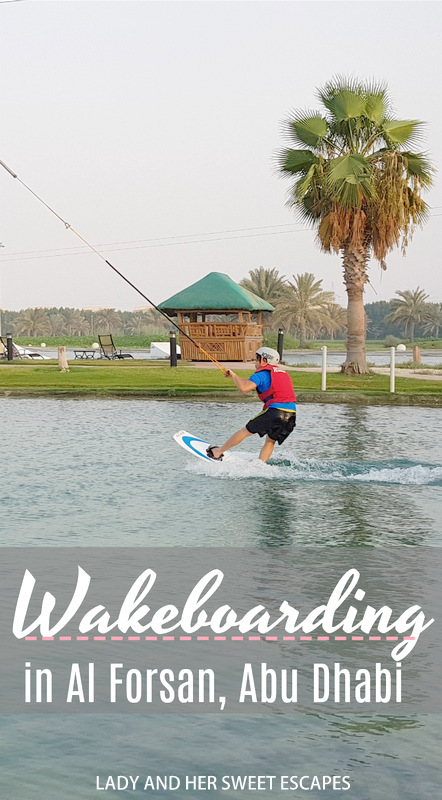 These are the wakeboarding sessions available. Prices are as of July 2017. Since it was his first time, he booked the 1 hour session. He registered in the electronic booth, presented his Emirates ID to the staff, signed a waiver, paid for his session, and received a colored wristband. It was a quick process as he had everything ready. Note: Bring a valid Emirates ID, Drivers License, Passport. For guests under 18, a parent must sign the waiver. After the registration, it was time to pick up the gear! 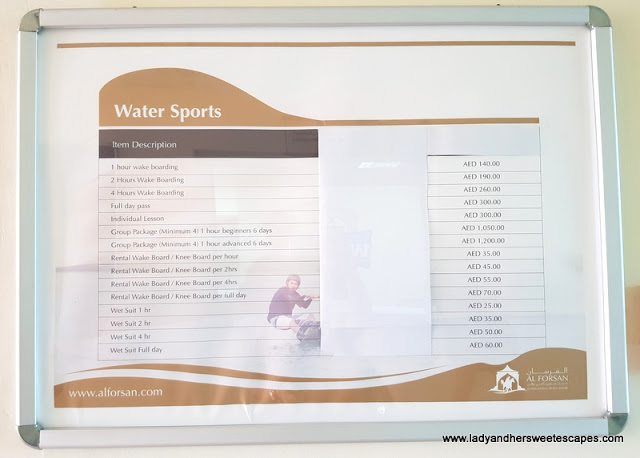 The regular fee includes wakeboard, life vest and helmet. Getting ready for a new adventure! The Water Sports Centre at Al Forsan International Sports Resort has the region's first water cable park system. 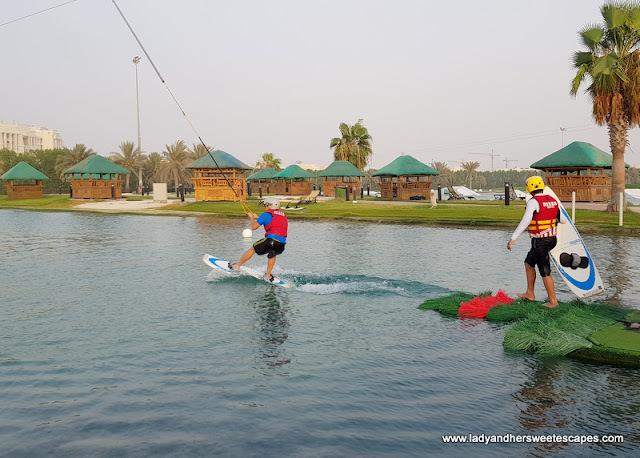 There is an overhead cable system around the banks of the man-made wakeboarding lakes. No tow boats here! We found three lakes in the area. The staff informed us that two are for pros, and the one with the straight cable is for beginners. Ed, on his first wakeboarding stint, went to the beginners' lake. He received a quick lesson on the ground before queuing for the real thing. "Fall down seven times, get up eight" they say! The lifeguard/ instructor gave him more tips. He shouted "Do not pull. Let it pull you!" time and again. He corrected his stance and taught him how to turn back when he gets to the end. Ed learned from it. He went from a 3-second awkward glide to a wobbly yet confident drift until he managed to do a turn. He surely loves the thrill! Ed wasn't able to level up to the pro lake during his 1 hour session, but I think he did well. At the end of the day, he told me "We should go back here with our friends soon!"